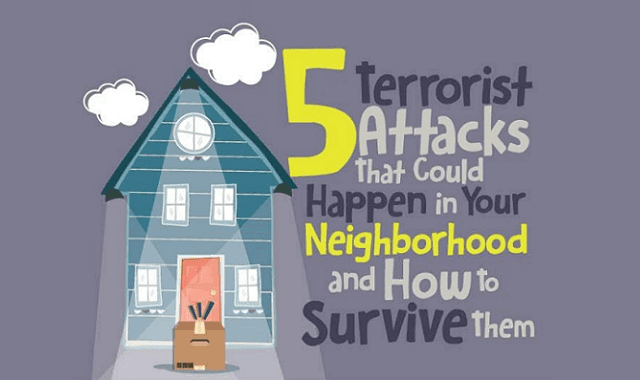 5 Terrorist Attacks That Could Happen in Your Neighborhood and How to Survive Them #Infographic ~ Visualistan '+g+"
Terrorist attacks have been creating havoc and fear for centuries, but we haven’t seemed to completely prevent them from happening again. Terrorism shouldn’t be a normal occurrence, and yet we still dread that one could happen near us any time soon. Terrorists don’t even have to belong in a religious group; they could be lone wolf terrorists, which means they operate on their own. They also don’t necessarily have to be motivated by religious reasons. There can also be other factors, including cultural, social and political. They don’t have to be tourists or someone who doesn’t live in your neighborhood. Even if you think your neighborhood is a safe place, it still isn’t immune to terrorist attacks.